BTECH NA-771 - Nagoya has taken another step to limit counterfeit listings. Compatible with all btech, uv-82hp, bf-f8hp, and baofeng Radios - Ideal for UV-5R, and SMA female connections. To avoid counterfeit Nagoya models - insure your listing shows "sold by BaoFeng Tech". This is a soft flexible antenna able to withstand more 'roughness' than a stock radio antenna, all while boosting the signal of your radio significantly! Specifications: Frequency: 144/430MHz Gain: 2. 15dbi max power: 10 watts VSWR : Less 1. 5:1 impedance: 50 ohm connector: SMA-F Length: 39. 6 cm ~15. 6 inches impedance : 50 ohms rohs compliant package: 1x nagoya na-771 booster antenna 1x rubber spacer compatible with: btech:gmrs-v1 na-701c ideal for gmrs, uv-82hp, uv-5r all models, murs-v1 na-701c ideal for MURS – The NA-320A Antenna is recommended for the UV-5X3BaoFeng:BF-F8HP, UV-82 Series, and all othersAnd any other radio that uses the SMA-FEMALE Connection Certified original nagoya Antenna - with an exclusive manufacturing partnership with BTECH. 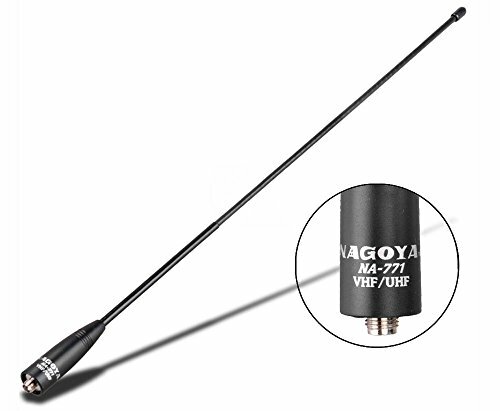 Authentic Genuine Nagoya NA-771 15.6-Inch Whip VHF/UHF 144/430Mhz Antenna SMA-Female for BTECH and BaoFeng Radios - This is a soft flexible antenna able to withstand more 'roughness' than a stock radio antenna, all while boosting the signal of your radio significantly! This antenna is almost 16 inches long and is a must for outdoor and camping usage. Handheld radio antennas arrive in a green poly bag with rounded corners, and the btech logo sealthis is the original Nagoya NA-771 Dual Band High Gain Antenna, a bag printed barcode might be covered by Amazon barcode, beware of the counterfeit copies of noted by their "Blue Logo" design or poorer quality cheaper build and performance This antenna is almost 16 inches long and is a must for outdoor and camping usage.
. New release - may require a rubber spacer included and has an extended antenna cover to protect your radio SMA male base from the elements. BTECH PC-03 (PC03) Programming Cable - Works with baofeng's latest radios: uV-5X3, BF-F8HP, and UV-82HP. No driver issues - No old drivers needed - Plug and Play. Helpful baofeng Guides and Programming Tips at Miklor. Com. Unlike the common "clone" USB programming Cables available Amazon - These cables just work! Genuine ftdi chipset - works with the latest windows, mac os x, and Linux Drivers If you are tired of messing with the "counterfeit prolific chips" in the 'other' cables available on Amazon - this cable this is your answer.
. Q: do i need to "back-date" or install a prolific driver? A: NO - those procedures found online are for counterfeit cables. Q: my computer did not automatically install the driver - now what? A: Download the and update to the latest FTDI driver at: baofengtech. Com/pccable or at anytonetech. Com/anytone-usb-cable Q: I need help using the software A: Miklor. BTECH PC03 FTDI Genuine USB Programming Cable for BTECH, BaoFeng, Kenwood, and AnyTone Radio - Com is an excellent resource site for AnyTone and BaoFeng FAQs and Software questions. Genuine ftdi usb programming cable only sold by BaoFengTech - insure BaoFengTech is your selected distributor to guarantee accuracy in receiving what is described. Also works with other models of radios that use the same 2-pin configuration including: AnyTone, Wouxun, Surecom, Linton, Puxing, FDC, Weierwei, and Quansheng. This cable will automatically install with the drivers on your computer. This cable works with the latest FTDI drivers The drivers are also downloadable directly from http://baofengtech. Baofeng UV-5R - Battery Saver 15. Emergency Alert 13. 25khz/12. 5khz switchable 12. Large lcd Display 10 Functions: 1. Fm radio 65. 0mhz-108. 0mhz 8. Auto keypad lock, dual band, Dual Display and Dual Standby. Roger set specifications : frequency range: 65-108mhz fm receive only; 136-174 MHz and 400-520 MHz TX/RX Channel No. 128 frequency Stability: ±2. 5ppm operating Voltage: DC 7. 4v output power: 4w / 1w max 5w dimension（w x h x d）: 100 x 52 x 32 mm weight: 250g （including battery, antenna） package Content: 1 x BaoFeng UV-5R VHF136-174MHz / UHF 400-520MHz Two-Way Radio 1 x 7. 4v 1800mah li-ion battery pack 1 x antenna 136-174/400-479. 995mhz 1 x earphone mic/headset 1 x belt clip 1 x hand strap 1 x eng manual 1 x adapter 1 x Desktop Charger 100V-240V Genuine ftdi usb programming cable only sold by BaoFengTech - insure BaoFengTech is your selected distributor to guarantee accuracy in receiving what is described. BaoFeng UV-5R Dual Band Two Way Radio Black - Keypad Lock 17. Monitor two different frequencies even on different bands VHF/UHF and the radio will monitor both frequencies giving priority to the first station to receive an incoming call. 1500mah battery; broadband wide 25khz / narrowband narrow 12. 5khz Selectable. 128 channels 50 ctcss and 104 DCS 5. BAOFENG VB-29 - Extend your uv-5r range with the recommended high gain antenna not included: B00KC4PWQQ Nagoya NA-771. Works with baofeng's latest radios: uV-5X3, BF-F8HP, and UV-82HP. Feel free to let us know if there are any questions or concerns. If you want to get 2 pack, you can search ASIN: B07K8QYJQD. X1f50b; safety ensured, effective Protection: Over-charge, over-discharge, over-heat, over-current and amp; short-circuit protection. X1f50b; we are striving to provide world class products and supports, and stand behind our products and services. Description: this is oirginal brand new battery for baofeng RD-5R/ UV-5R / UV-5RTP / UV-5R Plus Two-way Radio. High / low power settings 4w/1w programmable amateur radio; frequency range: 65-108 MHz Only commercial FM radio reception VHF: 136-174 MHzRx/Tx. Baofeng BL-5 3800mAh Extended Battery Compatible with UV-5R UV-5RX3 RD-5R UV-5RTP UV-5R Plus, Original Pack, Black - Uhf: 400-520 mhzRx/Tx. No driver issues - No old drivers needed - Plug and Play. Auto keypad lock, dual band, Dual Display and Dual Standby. X1f50b; radioddity is the only authorized US BaoFeng Distributor to honor the Manufacturer Warranty. Customize channel names, the boot display and More by Using the Optional not included PC03 Computer Programming Cable B00HUB0ONK. Helpful baofeng Guides and Programming Tips at Miklor. Com. Baofeng USB-02 - Feel free to let us know if there are any questions or concerns. Allows to hookup to PC for Radio Programming. Affordable Price. If you want to get 2 pack, you can search ASIN: B07K8QYJQD. X1f50b; safety ensured, over-discharge, over-heat, effective Protection: Over-charge, over-current and amp; short-circuit protection. X1f50b; we are striving to provide world class products and supports, and stand behind our products and services. Auto keypad lock, dual band, Dual Display and Dual Standby. X1f50b; radioddity is the only authorized US BaoFeng Distributor to honor the Manufacturer Warranty. Monitor two different frequencies even on different bands VHF/UHF and the radio will monitor both frequencies giving priority to the first station to receive an incoming call. Compatible USB Programming Cable for Baofeng Two way Radio UV-5R, BF-888S,BF-F8+ With Driver CD - Easy to use, compatible with most radios with 2-pin Mic Connector. Extend your uv-5r range with the recommended high gain antenna not included: B00KC4PWQQ Nagoya NA-771. Customize channel names, the boot display and More by Using the Optional not included PC03 Computer Programming Cable B00HUB0ONK. Compatible usb programming cable for baofeng two way radio uv-5r, bf-888s, bf-f8+ With Driver CD Genuine ftdi usb programming cable only sold by BaoFengTech - insure BaoFengTech is your selected distributor to guarantee accuracy in receiving what is described. 1500mah battery; broadband wide 25khz / narrowband narrow 12. 5khz Selectable. BaoFeng BF-S112 - No driver issues - No old drivers needed - Plug and Play. Mic 2. 5mm stereo bottom pin. 3 foot long cable 914 mm. Feel free to let us know if there are any questions or concerns. Allows to hookup to PC for Radio Programming. You must insure that Radioddity is your selected buying option. X1f50b; essential backup battery: with longer battery life, you would get a great using experience with your 5R Series radio. X1f50b; original pack for 5r's radio: compatible with baofeng uv-5r / uv-5r plus / uv-5rx3 / uv-5rtp / rd-5R Two-way Radio.2 pin 1x 3. 5mm and 1 x 2. 5mm jacks* These is 3. 5mm earpiece socket on the underside for privacy usage* back with strong clip and convenient for usecompatible model:- baofeng gt-3 / uv-82 / bf-888s / uv-b5 / uv-5r b / uv-5r plus / uv-5r / uv-5r plus qualette- uv-5r e plus / uv-82l - works with kpg-22 compatible kenwood handheld radios:tk-240, tk-349, tk-3160- works with linton handheld radio :lt-2288, tk-2102, tk-278, tk-340, tk-3118, tk-272g, tk-360g, tk-270, lt-3288, tk-3100, tk-3101, lt-3268, tk-378, tk-2100, tk-715, tk-360, tk-350, tk-373g, tk-255, lt-3260, tk-3107, tk-370, TK-2118, TK-250, TK-3102, TK-260G, TK-370G, TK-260, TK-431, LT-3188, TK-278G, TK-430, TK-378G, TK-353, TK-270G, TK-2107, LT-2188, LT-5288, LT-6288, LT-2268, TK-2160, LT-6188. Baofeng BF-S112 Two Way Radio Speaker - . Package:1 x original baofeng speaker genuine ftdi usb programming cable only sold by BaoFengTech - insure BaoFengTech is your selected distributor to guarantee accuracy in receiving what is described. High / low power settings 4w/1w programmable amateur radio; frequency range: 65-108 MHz Only commercial FM radio reception VHF: 136-174 MHzRx/Tx. ExpertPower TW-BABFUV5RH - Handheld speaker mic, easy to speak and hear without lifting your radio. Genuine ftdi usb programming cable only sold by BaoFengTech - insure BaoFengTech is your selected distributor to guarantee accuracy in receiving what is described. High / low power settings 4w/1w programmable amateur radio; frequency range: 65-108 MHz Only commercial FM radio reception VHF: 136-174 MHzRx/Tx. Accept no substitues. Avoid the counterfeits - expertpower is the most trusted and highest reviewed seller for Baofeng Batteries. Uhf: 400-520 mhzRx/Tx. Customize channel names, the boot display and More by Using the Optional not included PC03 Computer Programming Cable B00HUB0ONK. Unlike the common "clone" USB programming Cables available Amazon - These cables just work! ExpertPower Baofeng UV-5R Extended True Capacity Battery Model: BL-5L, 3800 mAh, Black DM-5R - Extend your uv-5r range with the recommended high gain antenna not included: B00KC4PWQQ Nagoya NA-771. Monitor two different frequencies even on different bands VHF/UHF and the radio will monitor both frequencies giving priority to the first station to receive an incoming call. Mic 2. 5mm stereo bottom pin. 3 foot long cable 914 mm. Works with baofeng's latest radios: uV-5X3, BF-F8HP, and UV-82HP. AnyTone Tech BL-5 12V Battery Eliminator - Replaces your radios stock battery while in the vehicle to direct DC power your radio. No driver issues - No old drivers needed - Plug and Play. The eliminator supplies power to the radio directly from car. This allows your radio to run off the vehicle or selected 12V source. Supply power to the bf-f8 and UV-5R series BaoFeng radios directly from your car with this battery eliminator. Purchase from us and avoid the counterfeits. More battery, more radio - this extended battery not only gives you incredible battery life, but it also increases the size of the radio making it easier to hold and handle. Peace of mind; 1 year warranty - if your product fails, help is just one phone call away! Our warranty does not cover purchasing error, so please make sure your radio is compatible by referring to the description. BTECH, BaoFeng BL-5 Battery Eliminator for for BF-F8HP, UV-5X3, and UV-5R Radios - Genuine baofeng tech battery eliminator Only Sold by BaofengTech - insure BaofengTech is your selected distributor to guarantee accuracy in receiving what is described. Helpful baofeng Guides and Programming Tips at Miklor. Com. Extend your uv-5r range with the recommended high gain antenna not included: B00KC4PWQQ Nagoya NA-771. Easy to use, compatible with most radios with 2-pin Mic Connector. Works with baofeng's latest radios: uV-5X3, BF-F8HP, and UV-82HP. BTECH BTECH QHM22 - Handheld speaker mic, easy to speak and hear without lifting your radio. Uhf: 400-520 mhzRx/Tx. Easy to use, compatible with most radios with 2-pin Mic Connector. With 8 adjustable positions for use with all kenwood k1 series 2-Pin Two-Way Radios such as BaoFeng, Wouxun, Kenwood, AnyTone, and others. Customize channel names, the boot display and More by Using the Optional not included PC03 Computer Programming Cable B00HUB0ONK. Genuine baofeng tech battery eliminator Only Sold by BaofengTech - insure BaofengTech is your selected distributor to guarantee accuracy in receiving what is described. Monitor two different frequencies even on different bands VHF/UHF and the radio will monitor both frequencies giving priority to the first station to receive an incoming call. BTECH QHM22 Platinum Series IP54 Rainproof Shoulder Speaker Mic for BaoFeng, BTECH, Kenwood Radios - Please refer to it if you need to check your radio compatibility. Freedom from the charger - this extended capacity battery is guaranteed to give you up to 50% extra time off the plug that the original 1, 800 mAh battery. Waterproof heavy duty remote hand/shoulder Mic with Speaker For "Kenwood 2-Pin Accessory" Radios BaoFeng, AnyTone, and others. Helpful baofeng Guides and Programming Tips at Miklor. AnyTone Tech BL-5 AA - Feel free to let us know if there are any questions or concerns. Allows to hookup to PC for Radio Programming. Helpful baofeng Guides and Programming Tips at Miklor. Com. Compatibility - a detailed list of compatible radios is listed in the description. Note: this is a battery eliminator, not car charger for your existing battery. Uhf: 400-520 mhzRx/Tx. Works with baofeng's latest radios: uV-5X3, BF-F8HP, and UV-82HP. Bl-5 aa battery pack for baofeng bf-f8hp, uV-5X3, and UV-5R Series Radios. Includes dummy Battery - Plug and Play Accessory. If you want to get 2 pack, you can search ASIN: B07K8QYJQD. X1f50b; safety ensured, over-heat, effective Protection: Over-charge, over-discharge, over-current and amp; short-circuit protection. BTECH, BaoFeng BL-5 AA Battery Pack for for BF-F8HP, UV-5X3, and UV-5R Radios - X1f50b; we are striving to provide world class products and supports, and stand behind our products and services. Extend your uv-5r range with the recommended high gain antenna not included: B00KC4PWQQ Nagoya NA-771. No driver issues - No old drivers needed - Plug and Play. If you use 6 aa alkaline or zinc carbon cells, the receiver works but the radio won't transmit Includes: BL-5 AA Battery Case 1 Dummy AA required for use with 5 Alkaline batteries Genuine ftdi usb programming cable only sold by BaoFengTech - insure BaoFengTech is your selected distributor to guarantee accuracy in receiving what is described. Replaces your radios stock battery while in the vehicle to direct DC power your radio. ARRL Inc 1625950829 - Use with arrl’s online exam Review for Ham Radio instructions are included inside the manual. Twin right angle: Ear 3. 5mm stereo top pin. Some hams use their skills to provide communications during emergencies and disasters when all else fails. Uhf: 400-520 mhzRx/Tx. Helpful baofeng Guides and Programming Tips at Miklor. Com. Accept no substitues. Avoid the counterfeits - expertpower is the most trusted and highest reviewed seller for Baofeng Batteries. Mic 2. 5mm stereo bottom pin. 3 foot long cable 914 mm. Feel free to let us know if there are any questions or concerns. Allows to hookup to PC for Radio Programming. It is a high quality microphone with Crystal clear audio. The ARRL Ham Radio License Manual Spiral - Compatible with all baofeng, some Wouxun, BTECH, and some Kenwood Radios. Genuine baofeng uv-5r and bf-f8 bl-5 aa battery Pack insure BaofengTech is your selected distributor to guarantee accuracy in receiving what is described. Use this book, and pass the 35-question Technician Class license test. The arrl ham radio license manual will guide you as you get started in the hobby–as you select your equipment, set-up your first station and make your first contact.